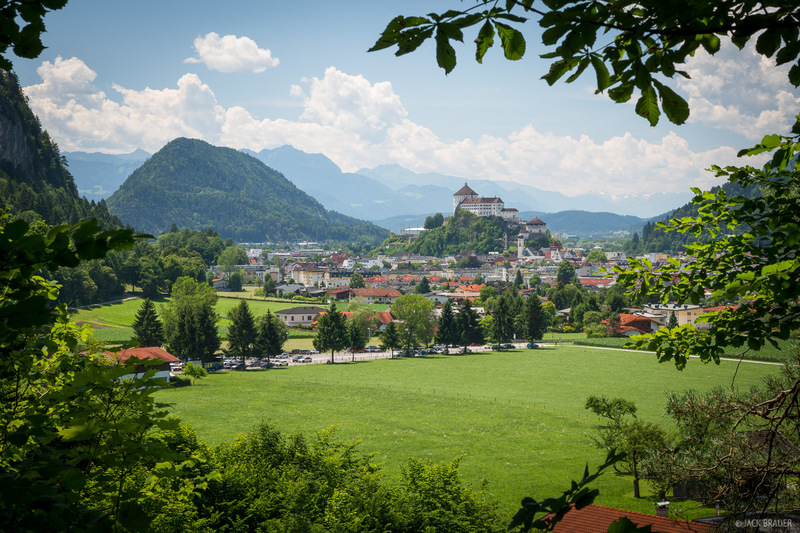 After our trek in the Karwendel we took a bus and train to the town of Kufstein, stocked up on some snacks, and started hiking into the Kaisergebirge, a small but incredibly rugged mountain range that rivals just about anything in the Dolomites as far as sheer jaggedness goes. This would be a shorter two-night trek but would prove to be much more strenuous than our previous one! 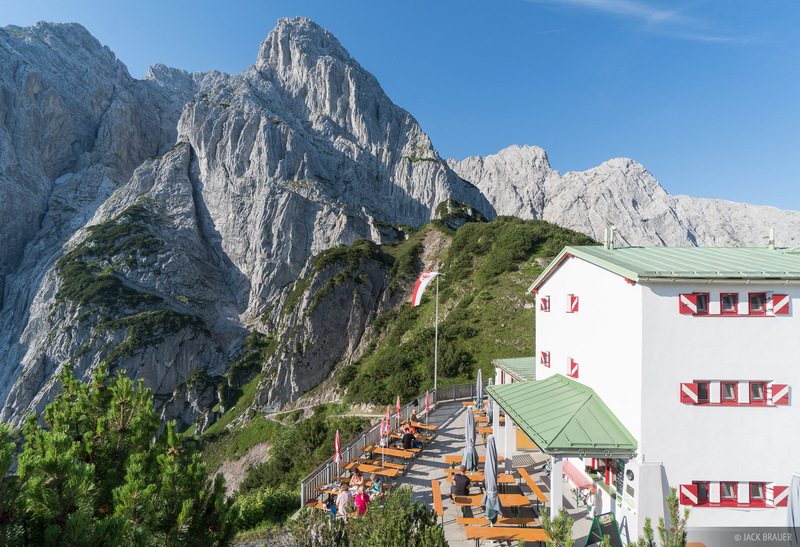 We spent the first night at the Vorderkaiserfeldenhütte, the second at the Stripsenjochhaus, then climbed over the Wilder Kaiser range via the famous Eggersteig route and down to the village of Ellmau. 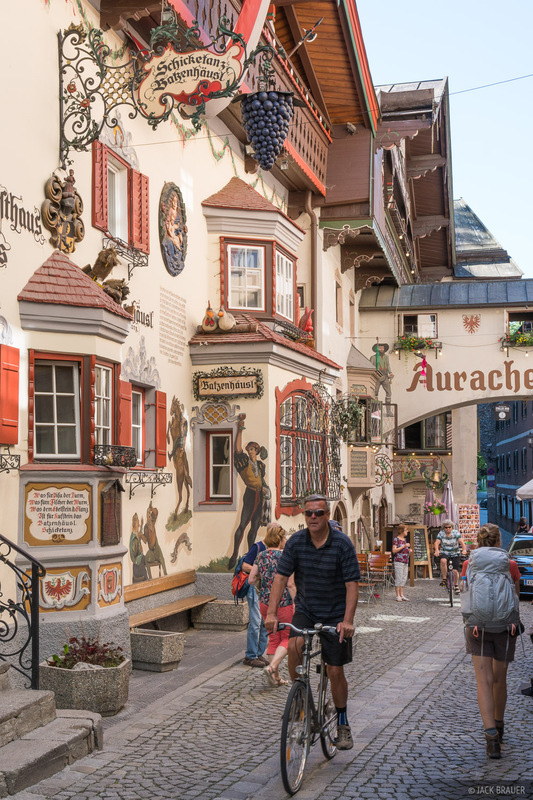 An often-photographed cobblestone alleyway in Kufstein, Austria. The Festung Kufstein (Kufstein Fortress), which towers over the town of Kufstein, dates back to at least 1205. A view of the rugged limestone peaks of the Wilder Kaiser. 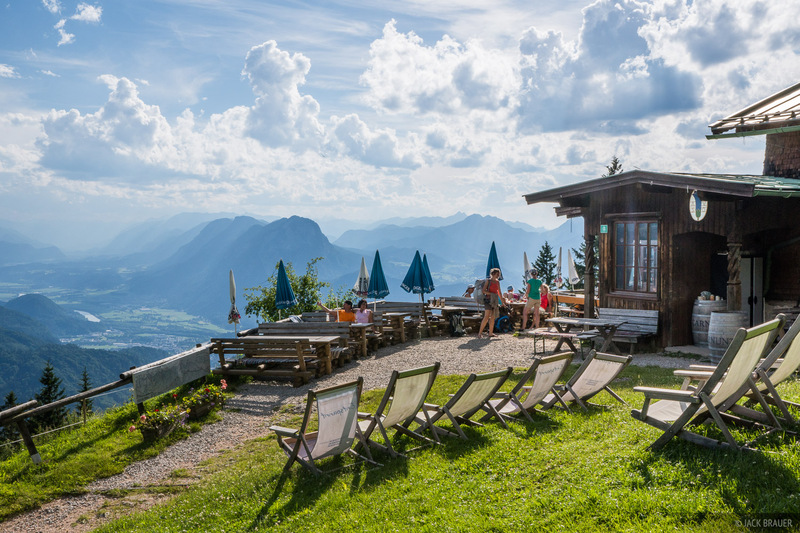 The Vorderkaiserfeldenhütte offers a stunning view over Kufstein and the Inn river valley. After a grueling 1000-vertical-meter walk up from Kufstein on a relentlessly steep forest trail in blazing heat and swarming horse flies, our spirits were quickly lifted at the Vorderkaiserfeldenhütte, sitting in the shade of an umbrella with a cool breeze and dunkel hefeweizen in hand. Happy to be at the Vorderkaiserfeldenhütte. Every hut in the Alps has its own unique character, and the Vorderkaiserfeldenhütte is one of my favorite alpine huts I've stayed in, with its awesome terrace views, beautiful dining rooms, and private sleeping quarters. Our private bedroom at the Vorderkaiserfeldenhütte. Sunset from Naunspitze, above the Vorderkaiserfeldenhütte. The river Inn flows north (to the right) out of the Alps on its way to the Danube and eventually to the Black Sea. After dinner at the Vorderkaiserfeldenhütte, I hiked up nearby Naunspitze to catch the sunset. 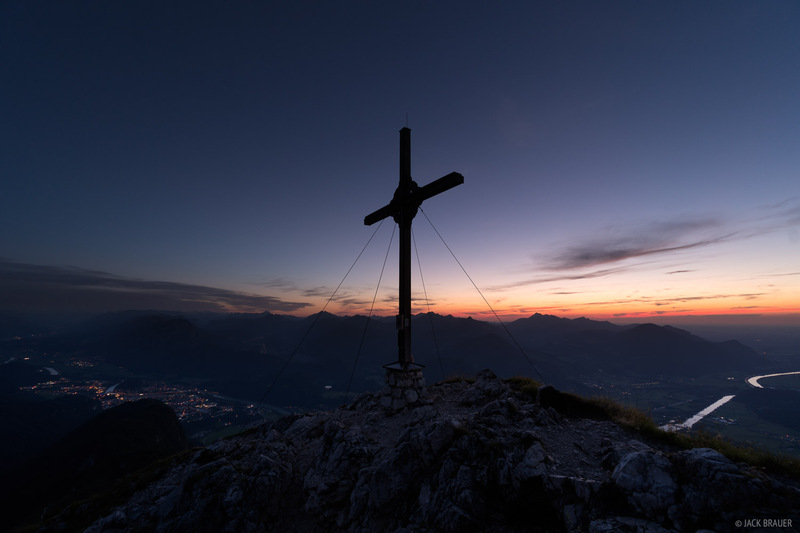 Crosses adorn nearly every prominent summit in Austria (and most of the Alps). Here's one atop Naunspitze after sunset. 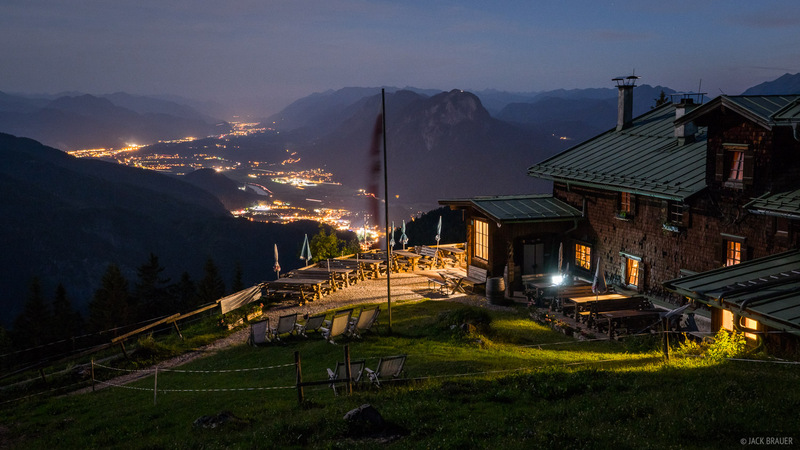 The Vorderkaiserfeldenhütte overlooks the lights of Kufstein and the Inn Valley 1000 meters below. 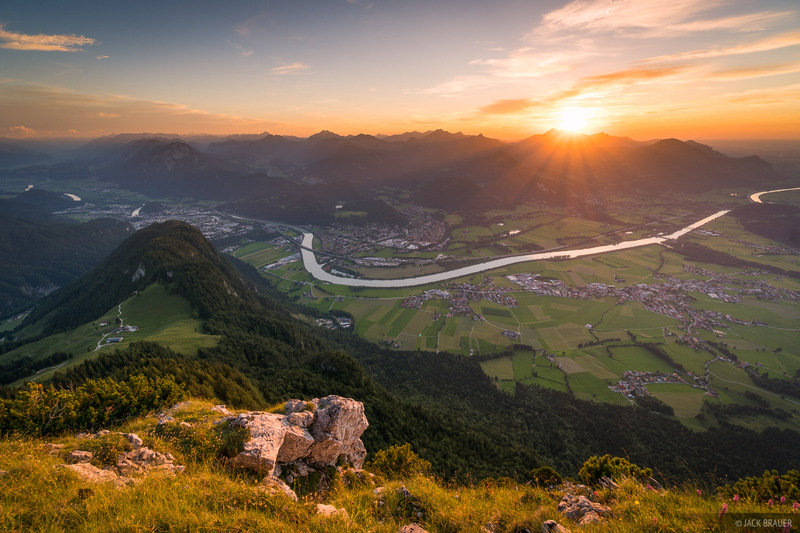 A panoramic view west of Kufstein and the river Inn from the summit of Peterskopfl - early July. Our second day's route from the Vorderkaiserfeldenhütte to the Stripsenjochhaus was another grueler; we decided to take a longer scenic route over the summits of Peterskopfl and Pyramidenspitze, which turned out to be much more strenuous than we expected, especially in the oppressive heat. 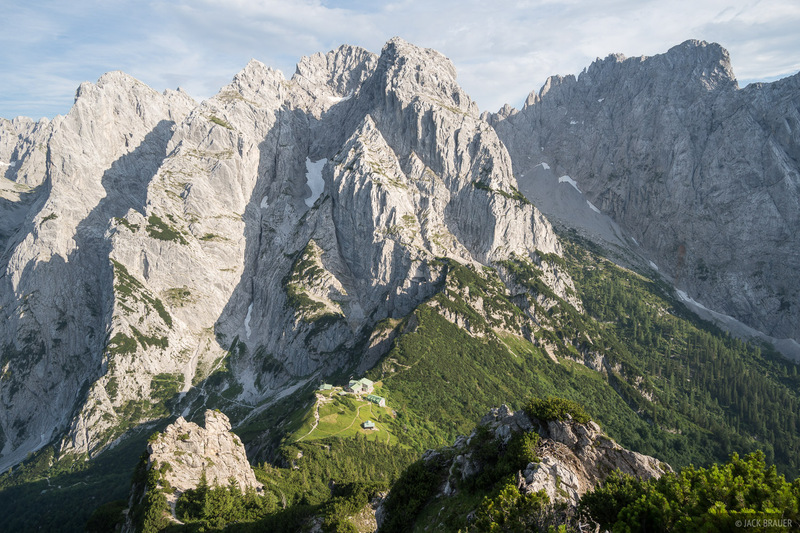 The Stripsenjochhaus hut sits on a saddle directly below the spectacular vertical limestone peaks of the Wilder Kaiser. 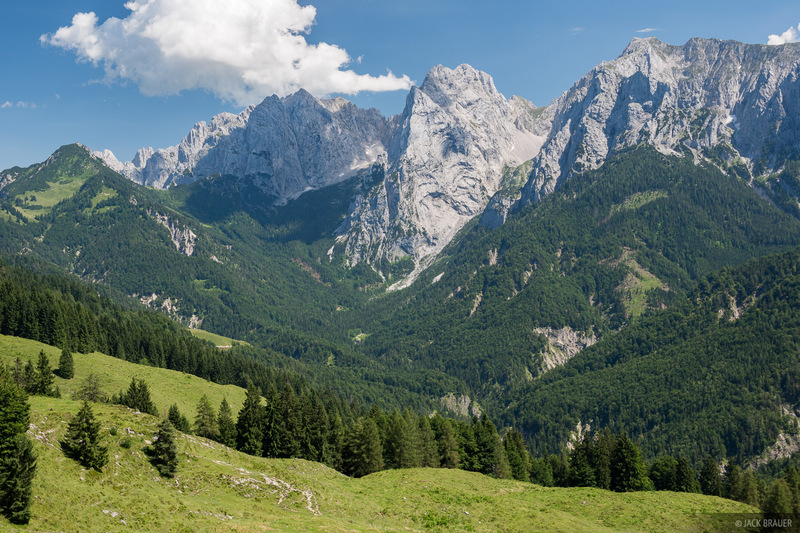 One of my primary goals of this trek was to photograph the rugged peaks of the Wilder Kaiser from the top of Stripsenkopf, above the Stripsenjochhaus. Exhausted and running late after a long day of hiking from the Vorderkaiserfeldenhütte, as we approached the last pass before the Stripsenjochhaus I knew that I didn't have time nor energy to descend to the hut, eat dinner, then ascend Stripsenkopf before sunset. So despite my hunger I decided to forgo dinner and just hike directly to Stripsenkopf to wait there for sunset while Claudia went to the hut to secure our beds. I was happy to photograph some nice sunset light on the peaks, then got down to the hut just in time for last beer call and an apple strudel that Claudia saved for me! Sunset light illuminates the rugged limestone peaks of the Wilder Kaiser, the main and tallest mountains of the Kaisergebirge. The blue line marks the start of the Eggersteig route over the Wilder Kaiser. 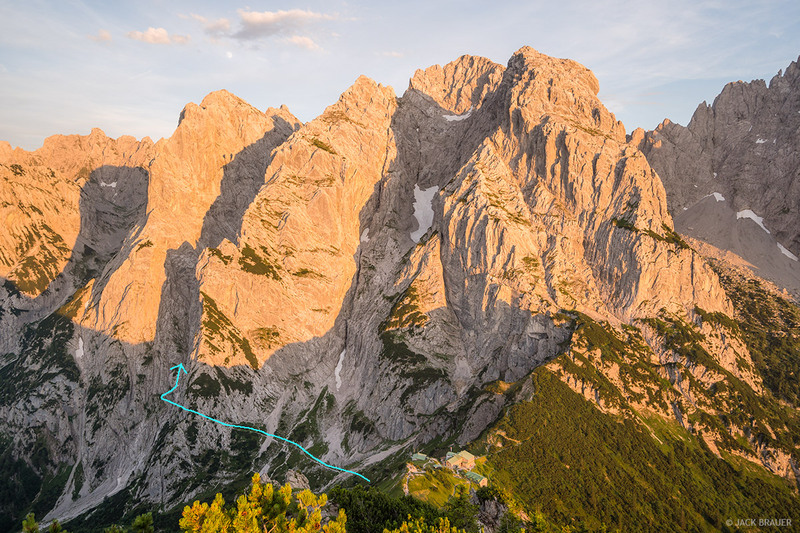 The blue line shows our planned route for the next day: the famous Eggersteig, which crosses over the Wilder Kaiser via an improbable route between two vertical limestone walls. Looking at this route the evening before, I had my doubts about whether or not it would be a good idea for us to attempt this! It looks impossible without climbing gear, but there's actually a cabled trail that ascends the steep couloir. 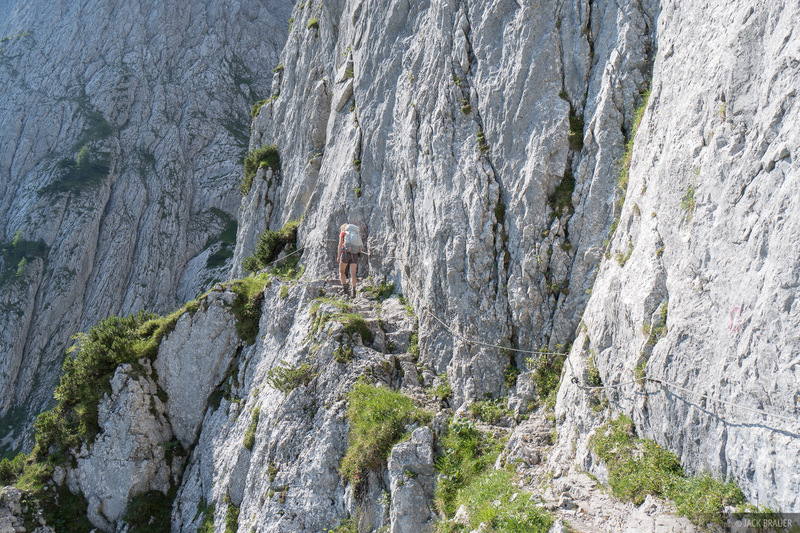 Hiking along a precipitous ledge at the beginning of the famous Eggersteig route. After a night at the Stripsenjochhaus we scrambled over the rugged Wilder Kaiser via the Eggersteig. 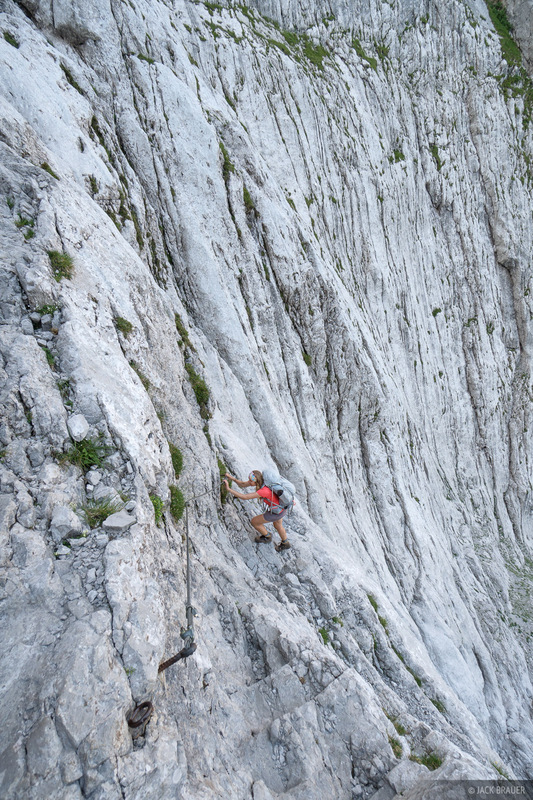 Scrambling up the Eggersteig between immense vertical limestone faces of the Wilder Kaiser. 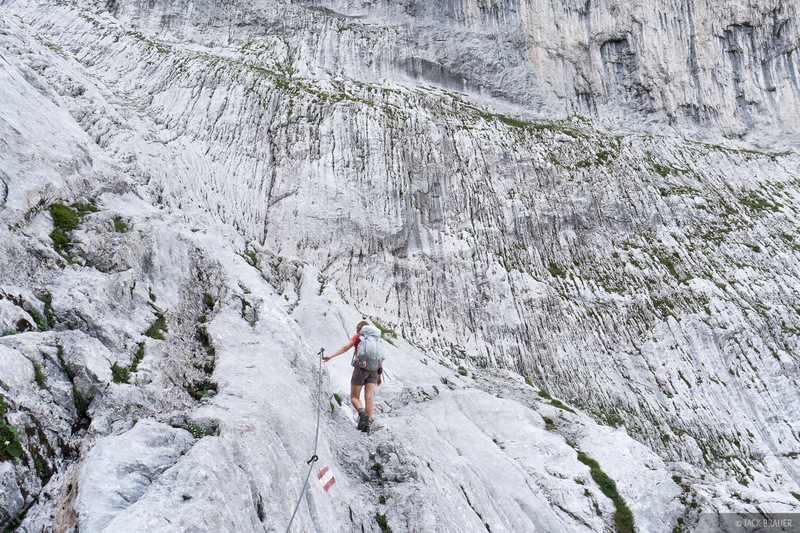 Though this route involves narrow ledges, climbing ladders and cables, and massive exposure, it’s actually possible to do it without a klettersteig (aka, via ferrata) kit. 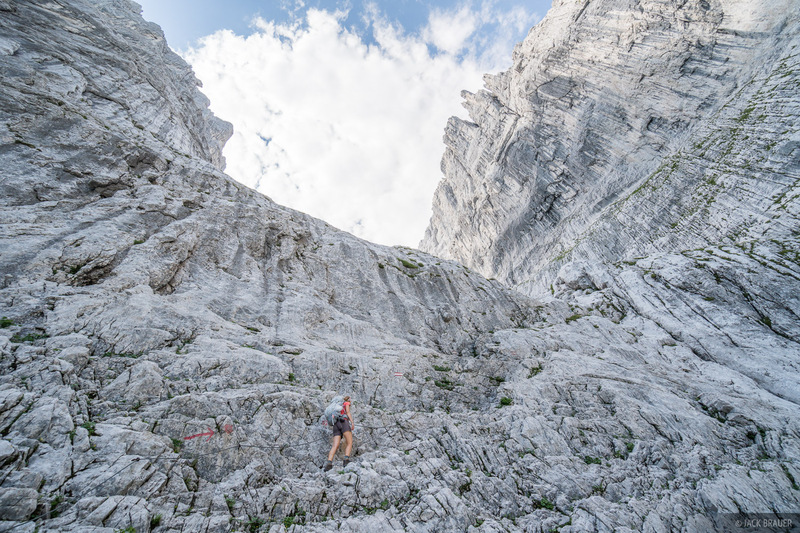 I have been on numerous via ferrata routes in the famous Dolomites of Italy, and I can say that the Wilder Kaiser peaks are definitely on par! I had loads of fun shooting photos almost straight up with my ultra wide lens, showing the mind-bending vertical walls looming overhead. 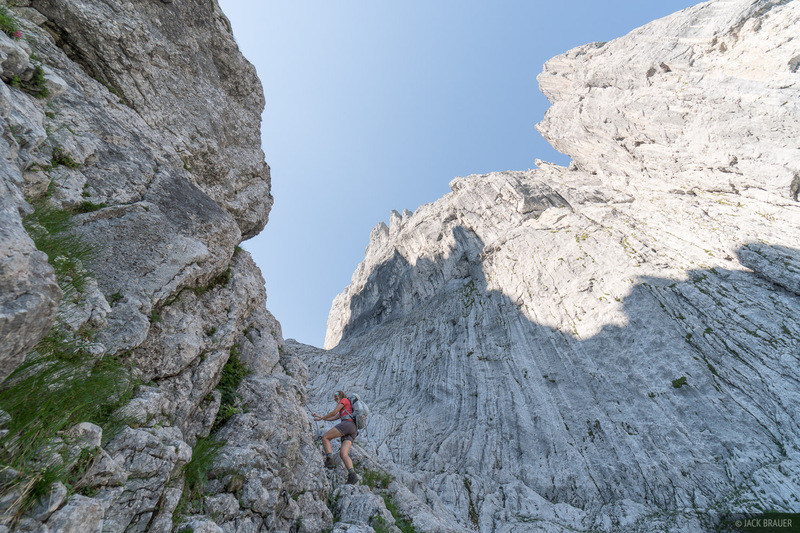 Scrambling up the intimidating Eggersteig route. Hiking the upper reaches of the Eggersteig. 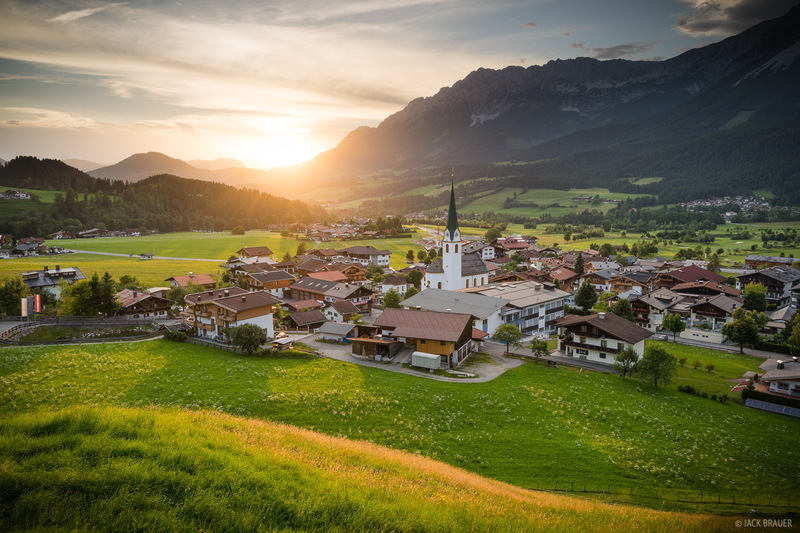 After passing the Eggersteig and crossing over the pass we made the long descent down the south side of the mountains and eventually walked into Ellmau, where we immediately got ice cream then went to the visitor center to find a place to stay for the night. 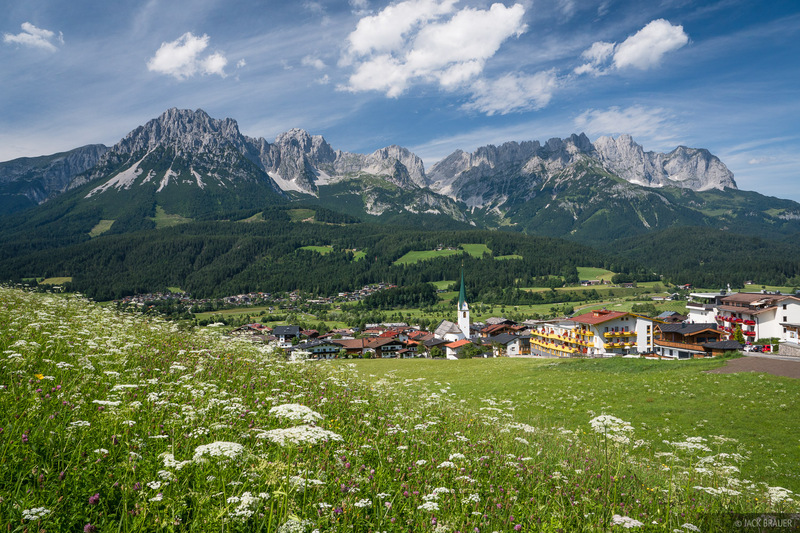 The picturesque village of Ellmau, surrounded by green meadows with the rugged Kaisergebirge towering above — quintessential Austria! 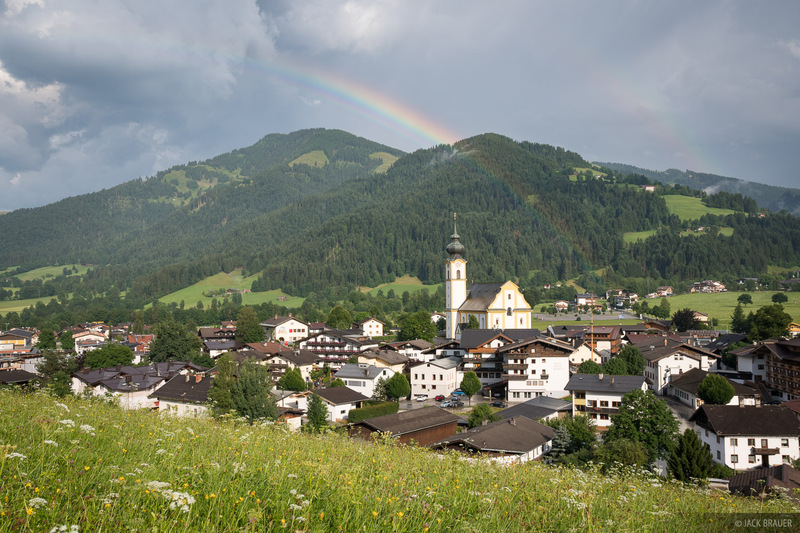 A rainbow shines over the village of Söll during a break in rainstorms. With a few days to kill due to a rainy forecast, we found a cheaper place to stay in the nearby town of Söll. That evening we sat on the porch and enjoyed a rocking thunderstorm with heavy downpours of rain and hail, glad to be safe in the village and not up on the Eggersteig! Posted in Backpacking & Trekking, Alps & Europe and tagged Austria.